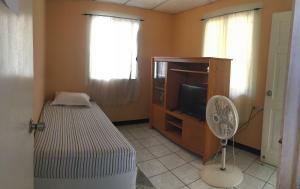 ﻿ Best Price on Hotel Xolotlan in Managua + Reviews! Hotel Xolotlan is located 984 feet from Parque Las Palmas and 1.9 mi from Managua historic center, and features 9 murals depicting the country's natural beauties. Free WiFi access is available in all areas. The hotel will provide you with a living room with dining area, hammock, garden, terrace, TV, air conditioning and cable channels. There is a full kitchenette with kitchenware and a coffee machine. Other facilities like a tour desk and free parking are offered. Guests can find a supermarket 1.2 mi away. This property is 1.2 mi from Simon Bolivar avenue and 1.6 mi from Port and Play Land Park Salvador Allende. Augusto C. Sandino International Airport is located 8.7 mi away.